Garden, Nancy. 1982. ANNIE ON MY MIND. New York: Farrar, Straus and Giroux. ISBN: 0374303665. Annie and Liza discover that falling in love is both wonderful and confusing. 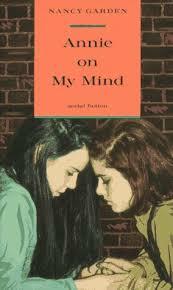 ANNIE ON MY MIND is a novel about two teenage girls who fall in love with each other. The story unfolds after the two girls meet in the Metropolitan Museum of Art in New York and become enchanted with one another. They begin to spend a vast amount of time together resulting in the self discovery that they are gay. “‘Look,’ said Annie. She closed her hand on mine and pointed up with her other hand. ‘The stars match the lights, Liza, look.’… ‘Real, but sometimes beautiful,’ I said, aware that I was liking Annie’s hand touching mine, but not thinking beyond that.” It is rather difficult for each of the girls at first, but through a series of events they eventually admit to themselves that they are gay and they truly love each other. However, that is only half of the battle. They have not told anyone else about their love and both are worried that someone may find out. Indeed, someone does find out, and that causes Liza some very unpleasant consequences at school. Not only are the consequences of the girls’ actions bad for Liza, but for other people as well. After the girls are discovered, Liza begins to question her true feelings for Annie. It is not until Liza is away at college that she begins to rethink her feelings for Annie. She thinks back to two statements Ms. Widmer and Ms. Stevenson said, “Don’t punish yourselves for people’s ignorant reactions to what we all are.” “Don’t let ignorance win. Let love.” This is when Liza is truly able to admit her feelings for Annie and picks up the phone to call her. Nancy Garden has created two very strong characters in Annie and Liza. Both are tormented and frightened by their feelings, but they continue to see each other while trying to discover their true identities. ANNIE ON MY MIND is a bittersweet love story that departs from the fact based information on homosexuality and describes the romance involved between the two characters. The story is well written and shares an experience that may open the eyes and hearts of many young adults.